As a hobbyist around the garden, I've dabbled on simple garden projects from plugging holes and cracks on a concrete wall to building garden wire trellises. In many of these garden projects, I found an exceptionally versatile product that you can work with so much ease and has proven to be indispensable, at least for me. The product I'm referring to is epoxy clay. This epoxy clay, as pictured below is advertised as a wet and dry sealant, meaning, supposedly, you can apply it on wet and dry surfaces. Maybe because this little product is more associated with plumbing jobs, that not many people know it can be a gardener's secret tool. In my case, it was only when I saw the properties of the hardened and cured clay did I realize how the product can have so many practical applications, and not just in plumbing. I've used it successfully in a wide range of simple garden projects from plugging holes in the garden concrete wall to fixing a broken garden wire cage. The clay is easy to work with and takes the consistency of putty when it's ready to be applied. The ease of use of this little-known secret product is summarized in the product label in 3 steps: Mix, Mold and Apply. Open the Epoxy Clay can and expose the contents of the containers of Parts A and B as shown below. Dip your fingers in the bowl of water and wet both of your palms. Pinch equal amounts of Parts A and B from the can. The combined mix of both parts should all be used in about 3 minutes, so consume sparingly. Mix the two parts thoroughly by kneading with the fingers and rolling the mixture in between your palms. Mix until a uniform color is achieved. To fill up holes, depressions or cracks, push the clay mixture into the depression and spread the rest so it becomes flush with the surface. To join two items (like wires) together as in a weld, keep them motionless by using vise grips or clamps. Apply the clay at the joint and taper along the edges where the clay gets in contact to the adhered surface. A bigger surface contact between the clay and the joined items ensures a stronger bond. Let the clay dry and cure for a minimum of 3 hours. Always plan in advance and get from the two parts as needed. Use sparingly so you don't waste clay mix that hardens. Break up the mixed clay into small parts if there are several areas of application. 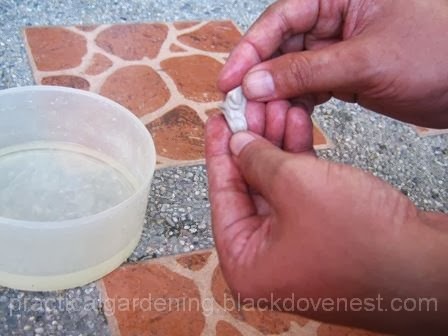 Drop the still unused clay in the bowl so it doesn't quickly dry and harden. Do plan on consuming all the mixed clay in 3 minutes. When finishing up, soak your hands in water to moisten the leftover clay on your palms and fingers. This will soften the remaining clay and will be easier to scrub off. Be mindful of possible loads that the hardened clay will be able to support, especially in the future. So be on the safe side and use adequate amounts to ensure a strong bond.